The house was built in 1851 by Asa Tift, a marine architect and salvage wrecker, and became Ernest Hemingway's home in 1931. The house still contains the furniture that he and his family used. The cats about the home and grounds are descendants of the cats he kept while he lived in the house, including many extra-toed (polydactyls), like the one Papa Hemingway loved. The house was built by Asa Tift, originally from Groton CT. He was a ship's architect and captain. Construction started in 1849 and was completed in 1851. Tift moved in 1851 with his wife Anna (Wheeler) and daughter Annie, two sons were born 1852 and 1854. Mr. Tift lost one son in 1852 and his wife and other son in 1854 due to yellow fever. Tift remained in the home never to marry again and died 1889. The limestone the house is built from was excavated directly from the ground beneath the structure, we believe he dug down about 14 feet. The estate is about 16 feet above sea level and the second highest point of ground on the island of Key West. Tift purposely chose this high elevation because it would allow him to excavate the stone from the site. The excavation was then back filled about 5 feet because the height in the basement is about 9 feet, not 14 feet. The back fill was probably the residue of the chippings from the stone’s excavation. The rough cut stone forms the walls and has a masonry finish on the face to give a smooth appearance and the lines that appear to be the outline of the stones are actually scribed into the masonry finish. We know Asa Tift had approximately 14 slaves and assume that was his labor force performing construction. We assume that the stone was all hand cut since there were no power tools available at that time. As far as alterations, electricity was added circa 1899, plumbing circa 1944 that's when Key West received piped in water from Florida City, prior to that we used rain water collected in cisterns. The estate has two cistrerns, one between the main home and the carriage house and one on the roof of the main home. Hemingway is shown on a wooden porch circa 1935, the porch is now concrete pavers installed sometime in the 1930’s. The rear portion of the wrap-around veranda and awnings were replaced after hurricane George 1998. 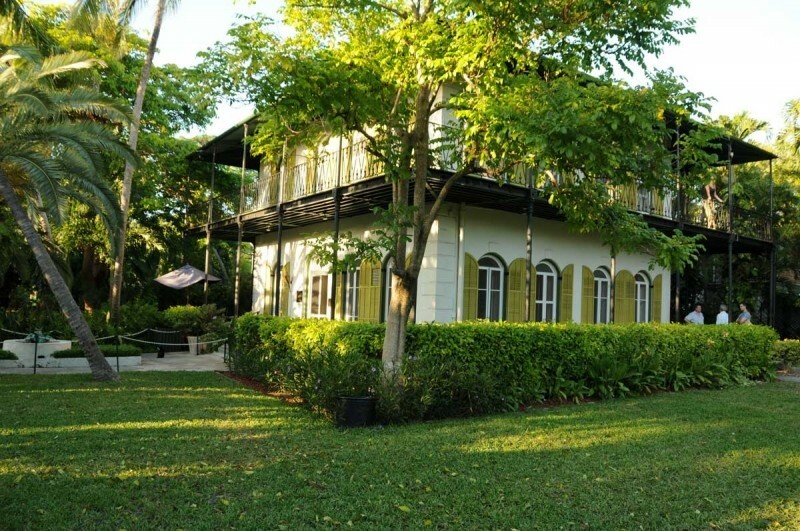 Hemmingway purchased the property in 1931 for $8,000 in back taxes from the City of Key West. Ernest Hemingway, wife, Pauline and their 2-sons, Patrick and Gregory lived together on the estate from 1931-1940. Hemingway left Key West for Cuba circa 1940. Hemingway died July 2nd 1961 in Ketchum, Idaho. The sons all agreed to sell the estate. Bernice Dixon, owner of the Beachcomber Jewelry Store, formerly on Duval St. bought the estate at a silent auction for $80,000. She resided in the home as her private residence until 1964 when she was humble enough to move into the rear guest quarters (book store) and opened the main home (only) as a museum and considered it a memorial to the life and times of Ernest Hemingway . In 1968 Bernice moved to a home in the lower keys and the Hemingway guest quarters then became the Bookstore where it remains today. Bernice passed away in the late 80’s and left the estate to her family and they operate it as the museum that you visit today. Today, the estate still remains to be the single largest residential property on the island of Key West.